The Silverados, southern California’s premier country rock cover band, recently chosen to open for Tim McGraw and Montgomery Gentry, have been rocking country music since 1992. Classic and current country influences from Merle Haggard and Johnny Cash to Carrie Underwood and Tim McGraw, shape The Silverados playlist. The band also mixes in classic rock hits from groups like The Beatles, Eagles, and Doobie Bros, to round out a wide variety of music. 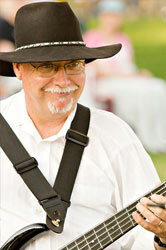 The Silverados will appeal to many music lovers and are perfect for almost any event. Mike started playing guitar in junior high school. Later in college he played with a small acoustic combo called “Sunset”. Fast forward to 1992 and Mike started playing guitar with the worship team at New Hope Community Church in Alta Loma, CA. At New Hope, he was asked to put a country band together for a Valentines banquet. Mike did so and the rest is history. Mike was influenced by Classic Rock of the 60s and 70s. He turned to country in the 80s because of the lyrics, harmonies, and fun of country music. The Silverados started playing at coffee shops and street fairs and the band was on their way. 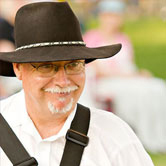 As the founding member of The Silverados, Mike has worked diligently over the past 19 years to advance the band in the community and Southern California. “The chemistry of the band is fantastic and it is still great fun after 19 years together,” says Mike. When not playing with The Silverados, Mike owns a small business and the band is a nice break from the rigors of running a company. Mike lives in Alta Loma with his wife and 15 year old daughter and has 2 daughters up and out of the house at 31 and 29 years old. Doug formed his first band when he was twelve and never looked back! 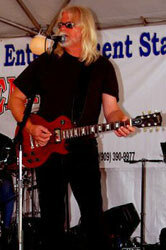 An original member of The Silverados, he sings and plays lead guitar. Raised on Merle Haggard and Buck Owens, Doug’s upbringing 30 miles north of Bakersfield established solid roots in country music. Later, The Beatles, Larry Norman, James Taylor, and Jackson Browne rounded out his folk-rock influences. He is also an active member of the Nashville Songwriters Association, International. Blue Sky Sliding is Doug’s newest CD release– a mixture of country and pop. Get it on iTunes! A veteran of the stage, his 1983 release, “Walking in the Father’s Love” received extensive airplay in the U.S. and Canada. 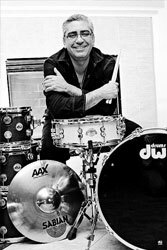 It featured Joe English on drums (home from playing with Paul McCartney & Wings). He has also published songs with Maranatha! Music. Doug also leads worship at Hillside Community Church in Alta Loma, CA. When he is not playing music, Doug teaches 6th grade, but then he plays music again to relax. What does he like about being a Silverado? The free water at the Concerts in the Park. Mmmmm! Delicioso! Scott has been into music since he was plinking on a neighbor’s piano at the tender age of 6. Surrounded and influenced by classical and contemporary music on his dad’s stereo hi-fi reel to reel he developed a deep love of all musical genres. Not to be limited by his classical roots he grew to love folk, country, Jazz, big-band, and of course with the arrival of his teens, rock and roll. Beethoven and Bach were now intermingled with British and American bands of the 60’s and 70’s such as the Beatles, Doors, Yardbirds, Santana, CCR, Chicago, CSN&Y, etc. 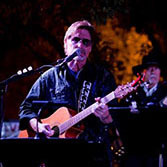 Since giving his life to Christ in 1970 he has always lent his guitar skills to leading worship in various churches, home groups, and bands he has been involved with. It was as a guest worship leader invited to a home study that he met his future wife. Although primarily a guitar player, he also plays piano, banjo, mandolin, violin (bluegrass fiddle) and anything else with strings. In the 80’s he picked up a bass when there was a need in his church and has stuck with it ever since. It was in 1993 that, working at the same company as band member Steve, he found out that due to the exit of their current bass man the Silverados had an opening for a new bass player. Steve asked him if he would like to try out for the Silverados. Although a little nervous at first, he played with them in their next gig, fit right in, and in that season of 1993 was accepted and welcomed as an official Silverado. He has been on the journey since then and has enjoyed every moment of it. Scott lives in Upland, Calif. with his wife and is a blessed father of 2 daughters and is “Opa” to 4 extremely cute grand-kids. The adventure continues. When she was growing up her dad always told her she should be a country singer… who knew! Julie was born and raised in Southern California. She grew up going to a large Baptist Church with a great music program. She got to sing, act, go on tours and even record children’s albums. Though she is from the 80’s generation, her musical roots go much further than that. 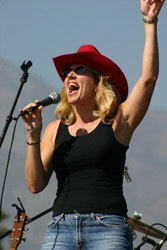 She grew up listening to Tanya Tucker, Glen Campbell, James Taylor, CS&N, and the Eagles. She still loves music with great harmonies today. 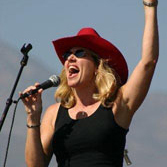 Julie has been with the Silverados since the beginning. She still loves performing at all of the different venues. Julie says, ” One of the best things at the Concerts in the Parks is having all of the girls come up and sing with us for a song. What a blast!” For her the Silverados is more than a band, it’s a family. When Julie isn’t hanging with the band, she is with her husband and 2 (nearly grown) children. She and her family live in Chino and she works for a great local escrow company in Claremont. And, of course, you can still find her singing on a Sunday morning at Pomona First Baptist, the same church she grew up in. Ray started banging on the drums at the young age of four years old. He hails from a family with a strong musical background that trails back to Gospel roots in Georgia. He studied percussion and played in the drum line in high school as well as competed in many “solo and ensemble” contests. He advanced to the state finals several times. 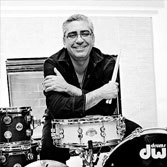 Ray studied music education, drums, and percussion at Midwestern State University in Texas and has performed in numerous types of bands. 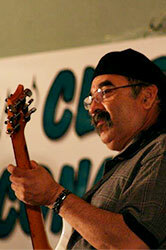 He is able to play multiple genres which include: Rock, Funk, R&B, Jazz, Big band, Fusion, and yes COUNTRY. He is most proud of his musical family. His wife sings, his son is an accomplished guitar player, and his daughter sings, plays several instruments, and is passionate about musical theater. 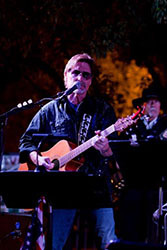 As an old rock and roller from “way back” in the 60’s, Steve Sanchez brings the unique lead guitar chops that give the Silverados their signature sound. 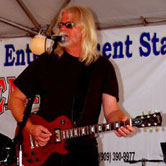 As one of the original members from the beginning he has proved to be a solid lead from classic rock to the latest country sounds utilizing classic amps and synthesized instrument sounds that only his talent can produce. 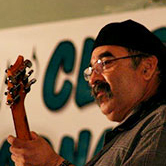 Steve came from a musical family and grew up performing, recording, and touring in bands in the 60’s. Opening for many headliner groups such as the Who, Santana, and many others. Today, along with playing in the Silverados, he is a worship leader at his church and spends time arranging, recording, and listening to his extensive collection of classic rock and jazz LP records. Ashley was born in Crowley, LA and currently resides in Alta Loma, CA. Based on her southern roots, it should come as no surprise that Ashley's first and foremost love of music is country. 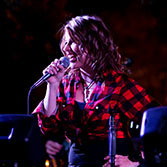 When Ashley was just 6 years old, her dad Jim bribed her with five dollars to sing karaoke at a local pizza restaurant. When Jim saw the response she received from the crowd, he knew right then and there it was destined for her to become a professional country artist. NASCAR in September 2005 at the California Speedway with 90,000 in attendance. It was broadcast worldwide on the FX Network and also reached military bases around the world. In August 2005, Ashley entered a content sponsored by the local radio station KFRG and won the grand prize of $10,000 worth of furniture from Living Spaces. In September 2005, Ashley was given the honor to be the opening act for The Oakridge Boys. Duane Allen of The Oakridge Boys commented to the Daily Bulletin newspaper, "She's great, very good voice, she's already got something going....My Advice to Ashley is to find the right son, the right promotion. Three minutes of magic could determine how long her career could last." 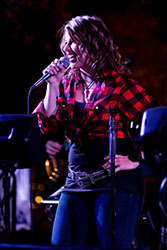 In September 2007, 2008, and 2009, Ashley sang for the largest classic car show in the country known as the Route 66 Rendezvous. In May 2009, Ashley was asked to perform at the Police Officer's Memorial Service which was held in Sacramento, CA with several thousand people in attendance including former Governor Arnold Schwarzenegger. Ashley sand songs requested by the families of the fallen officers.